Personality: Not really as charismatic as his cohort Cabanela. They both share a good relationship though. He's serious and prefers to think things through and analizing them, unlike Cabanela who always jumps into action. He's mostly anti-social and never smiles. He normally critizes people he sees and points out their mistakes quite often. 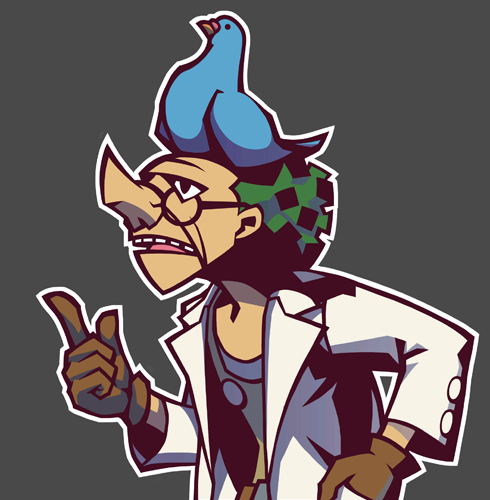 He's very loving and caring for the blue pigeon he has on his head and is bothered by people who make fun of his pigeon, Lovey-Dove. 1. Is perhaps smarter and wiser than Cabanela and knows how to properly investigate a scene better. 2. An expert Engineer, he knows how to repair any damages done to the ship on the double. 3. Knows how to work the Gummi Ship properly. 4. Can have his pigeon do favors for him, including hiding or putting stuff away for him or flying somewhere or bringing him light objects. 5. Knows how to treat physical wounds due to his previous job. Additional Information: Very short on height. He is half as tall as Cabanela. Despite that, he's actually more heavy than what he looks like. He's strangely proud of this fact. The blue pigeon he has on his head is called "Lovey-Dove" and is quite fond of him. He's about the size of his head and is very fat. He doesn't hesitate to carry out favors for his master.